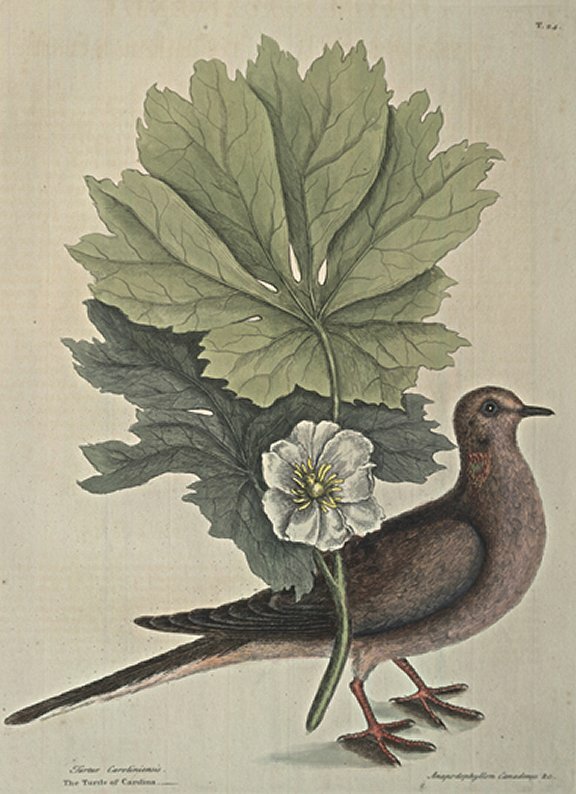 This is somewhat less than a Dove-house Pigeon: the Eyes black, compassed with a blew Skin: the Bill black: the upper part of the Head, Neck, Back, and upper part of the Wings brown: the small feathers of the Wing, next the Back, have large black spots: the lower part of the Wing and Quill-feathers of a lead colour, three or four of the longest being almost black: The Breast and Belly of a pale Carnation colour. On each side the Neck, the breadth of a Man's Thumb, are two spots of the colour of burnished Gold, with a tincture of crimson and green; between which and its Eye is a black spot. The Wings are long, the Tail much longer, reaching almost five Inches beyond them, and hath fourteen feathers, the two middle longest, and of equal length, and all brown; the rest are gradually shorter, having their upper part lead colour, the middle black, and the end white. The Legs and Feet are red. They breed in Carolina, and abide there always. They feed much on the Berries of Poke, i. e. Blitum Virginianum, which are Poison. They likewise feed on the Seeds of this Plant; and they are accounted good Meat. This Plant grows about a Foot and half high; the Flower consisting of several Petala, with many yellow Stamina sourrunding the seed-vessel, which is oval, unicapsular, and contains many roundish Seeds. The Leaves of the Plant resemble the Aconitum lycoctonum luteum C.B. Pin. The Root is said to be an excellent Emetic, and is used as such in Carolina; which has given it there the Name of Ipecacuana, the stringy Roots of which it resembles. It flowers in March; the Fruit is ripe in May; which has occasioned it in Virginia to be called May-Apple.